In an ideal world all team members would run with the ball all of the time. But rarely have I seen that to be the case. We all drop the ball from time to time. The trick is figuring out the best way to handle it when it happens to one of your team. The model is split into two halves. The top half represents what the business needs from high performers — things like respect, honesty, and making best use of your genius. We call this 'making our life easier' or SERVICE. 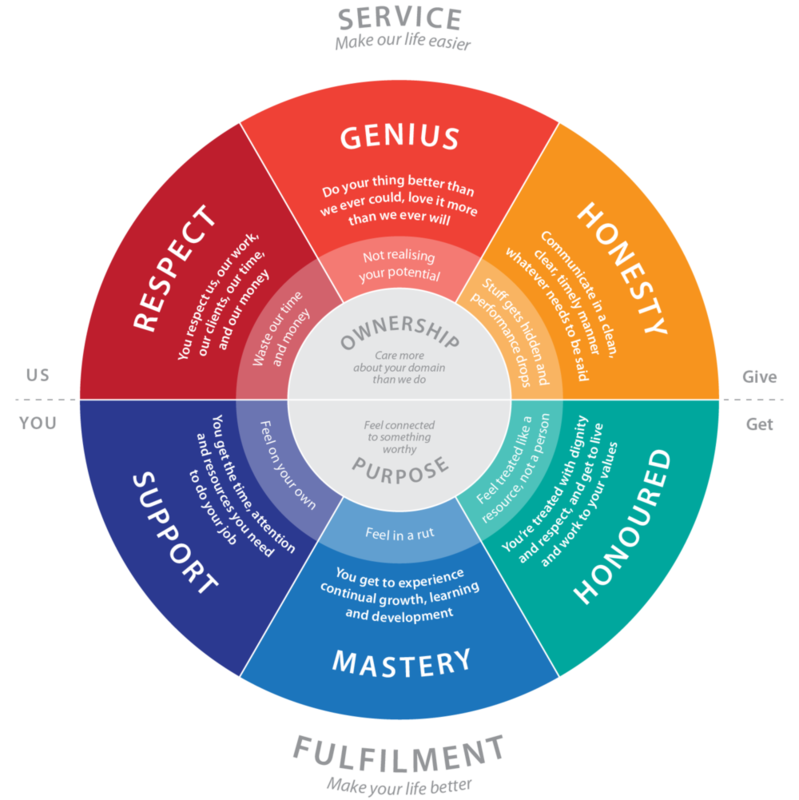 The bottom half represents what the team member gets when working in this way — things like support, mastery, and the dignity and honour of being a unique person in the team. We call this 'making your life better' or FULFILMENT. The model acts as a great aspirational guide and we use it to remind us of the ideals that we should all be striving to achieve every day. Sometimes though, we drop the ball. It's when a team member is not operating at their best that things can get difficult. Sometimes they need coaching, sometimes they need mentoring, and sometimes they need to be confronted to prevent them from undermining the efforts of the whole team. This model details a variety of recommended strategies and actions that managers can take to respond to issues that a team member may have. The grid structure of the model serves to guide our way of approaching performance issues differently, as varying behaviours and personalities often require very different strategies in order to be effective. The model highlights the various symptoms that can indicate where friction is occurring among team members which managers should stay aware of, and guides the most appropriate dialogue to remedy it. You should use the model as an intervention map that can help you better manage the performance of your teams, so that high performers stay motivated and people performing poorly can be brought back on board. It is vital to remember that your management response must be tailored to each individual issue on its own merits. In some instances this may involve confronting someone who is undermining their own and the team’s performance. In other situations the appropriate response may simply be to shield and reassure one of your team members so that they can maintain a high level of performance. It is vital to remember that your management response must be tailored to each individual issue on its own merits. The importance of setting the right tone and approach is very well demonstrated by Steve Kerr, the coach of the Golden State Warriors, a team which has won two of the last three NBA Championships. In this rare moment we get to see what best practice empowerment, coaching and feedback look like, as Kerr – who won five championships as a player – mentors and shields the team’s star player, Stephen Curry. Remember, everyone has good and bad days whether they are the best performing veteran or the newest team member with the lowest confidence levels. The key point to recognise is that at certain times they both need appropriate leadership and guidance in order to keep your team working at the highest level.